Michelangelo di Lodovico Buonarroti Simoni or more commonly known by his first name Michelangelo was born today, March 6, in 1475. He was an Italian sculptor, painter, architect and poet of the High Renaissance born in the Republic of Florence, who exerted an unparalleled influence on the development of Western art. Considered by many the greatest living artist during his lifetime, he is also considered one of the greatest artists of all time. Despite making few forays beyond the arts, his artistic versatility was of such a high order that he is often considered a contender for the title of the archetypal Renaissance man, along with his rival, the fellow Florentine and client of the Medici, Leonardo da Vinci. 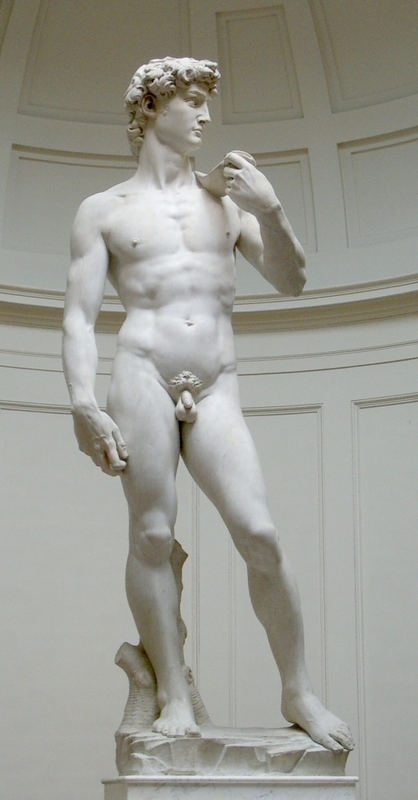 A number of Michelangelo's works of painting, sculpture and architecture rank among the most famous in existence. His output in these fields was prodigious; given the sheer volume of surviving correspondence, sketches and reminiscences, he is the best-documented artist of the 16th century. He sculpted two of his best-known works, the Pietà and David, before the age of 30. Despite holding a low opinion of painting, he also created two of the most influential frescoes in the history of Western art: the scenes from Genesis on the ceiling of the Sistine Chapel in Rome, and The Last Judgment on its altar wall. His design of the Laurentian Library pioneered Mannerist architecture. At the age of 74, he succeeded Antonio da Sangallo the Younger as the architect of St. Peter's Basilica. He transformed the plan so that the western end was finished to his design, as was the dome, with some modification, after his death. Michelangelo was the first Western artist whose biography was published while he was alive. In fact, two biographies were published during his lifetime. One of them, by Giorgio Vasari, proposed that Michelangelo's work transcended that of any artist living or dead, and was "supreme in not one art alone but in all three." Michelangelo was a devout Catholic whose faith deepened at the end of his life. He was abstemious in his personal life, and once told his apprentice, Ascanio Condivi: "However rich I may have been, I have always lived like a poor man." Condivi said he was indifferent to food and drink, eating "more out of necessity than of pleasure" and that he "often slept in his clothes and ... boots." His biographer Paolo Giovio says, "His nature was so rough and uncouth that his domestic habits were incredibly squalid, and deprived posterity of any pupils who might have followed him." He may not have minded, since he was by nature a solitary and melancholy person, bizzarro e fantastico, a man who "withdrew himself from the company of men." In 1542, Michelangelo met Cecchino dei Bracci who died only a year later, inspiring Michelangelo to write 48 funeral epigrams. Some of the objects of Michelangelo's affections, and subjects of his poetry, took advantage of him: the model Febo di Poggio asked for money in response to a love-poem, and a second model, Gherardo Perini, stole from him shamelessly. 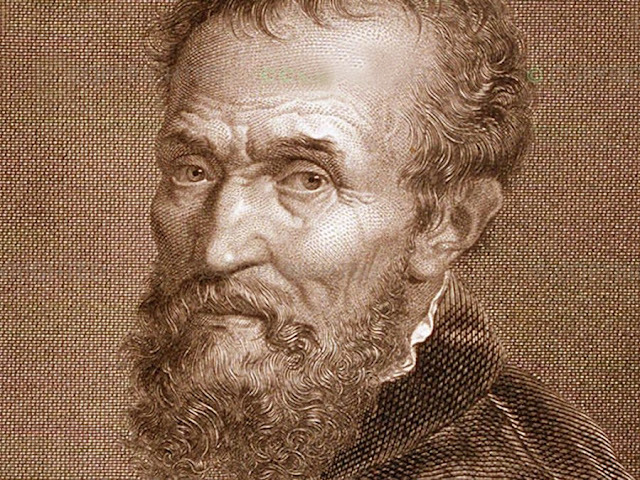 Michelangelo died in Rome in 1564, at the age of 88 (three weeks before his 89th birthday). What words can one add? And Charlton Heston, who played him in 'The Agony and the Ecstasy', claimed that Mich wasn't gay - the silly man! However, it takes all sorts, he also having been a fervent supporter of the NRA, of course! 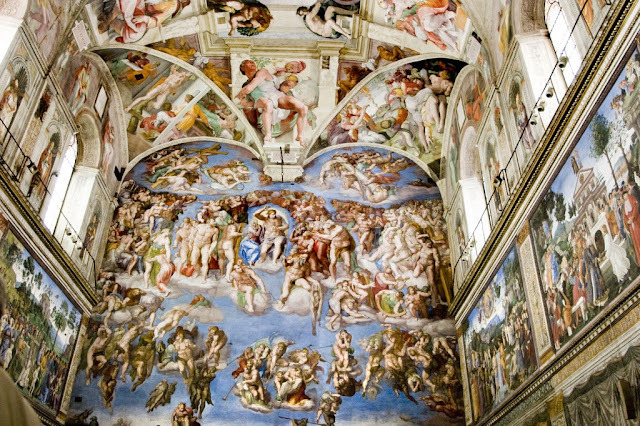 The Sistine Chapel's literally awesome ceiling must be one of the greatest of the Vatican's many ironies in terms of the artist - some might say 'hypocrisies'. Maybe they ought to donate that section of the building to some Humanist organisation which won't be subjecting it to the ravages of burning incense from below - or maybe they don't do that here any more, though if they do they jolly well ought to cease forthwith!